On a very cold January morning in 2001, I woke up feeling a little apprehensive. 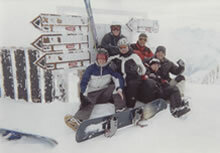 I was on a “lads” adventure holiday snowboarding and skiing in the French Alps. The night before we had planned to ski off the back of the infamous mountain, Pic Blanc in Alpe D’huez. I’d been there 10 years before so I was well aware of the mountain that boasts the longest black run in the world and a terrifying icy tunnel and a severe drop mogul field. If that wasn’t enough, we were planning to go off the back of the mountain into the land that time forgot. I had hoped when the bravado had waned along with the alcohol from the previous evening, the chaps may change their mind; no luck! I remember opening the shutters to find the mountain shrouded in cloud with severe weather conditions. I was relieved to say the least. Yet the boys were undeterred. Not one to back down or show my fear, I ate my breakfast contemplating the morning ahead and hoping the lifts would be closed. They had organised a guide called Stephane and they were opening the two lifts especially for us and we had a helicopter for the return trip, as we were heading deep into French National Trust land. You can imagine my joy! After a serious briefing we put on our avalanche detectors, strapped our helmets picked up our tackle which including lightweight shovels, then followed Stephane to the lift. There is something doubly eerie ascending a mountain in a lift made for 100 skiers with just seven people. No one really said anything and it was clear I was not the only one scared. Everyone was feeling apprehensive. The lift swayed in the gale as we rose higher up the mountain. We could see absolutely nothing.At the halfway point we had to get out to swap lifts. We could still barely see anything as the snow and wind forced our eyes closer together. I got off the phone and told the guys what Gail had said, and they all burst out laughing thinking I was having a joke. The idea of backing down was incomprehensible. I put the fears to the back of my mind, made a promise to myself to be careful and I took a minute to prepare myself mentally for the journey ahead. This was now very real. On a brighter day it would have been less intimidating. Only slightly though. Seeing all the ski-run signs at the summit of Pic Blanc, all red with “ferme” on them makes you apprehensive to say the least. We stood assembled under the signs and Stephane took a photo. The sky was beginning to clear at the top and although very windy, we headed towards some huge netting and a sign that read “DANGER”. This was really the most inhospitable place I had ever been on the planet. I could barely see with the snow blowing in my face. We traversed in single file to the edge of a cliff where we could read the rest of the sign. Roughly translated, it pointed out that only crazy people who wanted to invalidate their insurance ventured past this point. That certainly sounded like our group of thrill seekers and off we went one at a time. I have been on the edge of cliffs before, but strapped to a snowboard, in these hideous weather conditions, I could feel my entire body beating in time with my heart. We regrouped on the edge of what can only be described as near vertical cliff that morphed into a steep field of snow. I recall hurtling down the mountain almost vertically, the fear suddenly flushed away by adrenalin. Exhilaration and euphoria were my new companions.This is the holy grail of boarding, I thought. Endless fields of virgin powder as far as the eye could see. Snow so deep and soft that you couldn’t feel it below you. It feels as though you are hovering just above the ground. It’s quite fantastic. Every now and then we would stop, to traverse across flatter areas. These were higher risk avalanche areas with ridges above, so we were warned not to speak and to traverse one at a time to limit the possibility of the mountain collapsing on us. It is amazing how your body and mind adjust to circumstances very quickly when put under pressure. It was only moments earlier that I was silently terrified. Now I was relaxed and I was enjoying haring down steep blankets of never ending snow. We reached another high-risk avalanche area. This time though it was about a 1km in length to safety on the other side. With an overhanging ridge above to our right, respecting the mountain, we traversed across one at a time in silence. There was drop to our left too but all fear had subsided, we were now invincible. The aim was to keep as high as possible and keep as quiet as possible and to meet at the other side. I was the penultimate one and I was struggling to keep my speed up on my snowboard. Danny Robb the last in the group was behind me on skis, caught me up and as he went past gave me a friendly dig knocking me off my board. This proved to be disastrous. I had purchased a set of clip on bindings in Canada the week before so I detached my snowboard and started to walk. 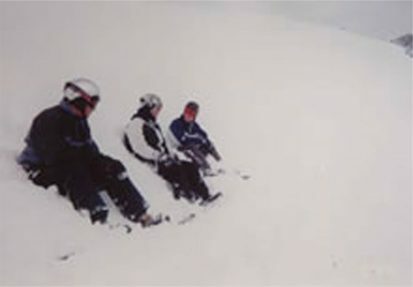 In the time it took to remove my snowboard and stand up, the others had regrouped and were waiting for me watching in disbelief as the mountain came down and I disappeared. For me, and for what I experienced, it is difficult to explain. The order in which everything happened is hard to place. I don’t remember a noise, yet there was a loud crack as it started. I remember for the first time now that I write this down eight years later, seeing the boys together waiting for me, waving their arms shouting to warn me as I got sucked under the snow. That was the last I saw of them.I remember attempting to wrestle with the mountain as a huge force was sweeping me away. I was confused as to what was happening, at first I thought it quite amusing not realising the seriousness of the predicament I was in. It felt too slow to be an avalanche, not that I would know what to expect from one. Yet it was an avalanche and God help me, I was in it. The fact that it seemed slow was just my brain working over time to try and help me escape. There was no fear; not fear as we know it. There was a stark reality check and clear, controlled precise thought. At the same time there was absolutely nothing I could do. The adrenalin must have been saving me for was coming next. I stopped fighting the mountain of snow, it was futile. It was highly likely I was going to need all the energy I could muster in the coming moments. The sudden realisation that you are about to die and there is absolutely nothing you can do to prevent it is ironically life changing. Just all a bit too late! I was now underground being turned over and over. I relaxed and went with the flow. I was sucked deep down below the surface. The lights went out and suddenly everything was quiet, very dark and very still. My only companion now was the sound of myself panting for air that didn’t exist, and a sub conscience that was attempting to deal with the facts. “I had really done it this time!” It was as clear as the daylight above ground that I was never going to see again, my life was over. I vividly recall my mouth, eye sockets and every part of me compressed on every side with tons of snow on top of me. I was breathing hot air that quickly disappeared turning to carbon dioxide which gave me the sensation of drowning.People often ask did I “create a pocket of air with my hands?” And I think this may be possible if you are near the surface of the snow. But what happens deep down is the weight of the snow forces out any remaining air you have in your lungs. Before quietly passing away, it was clear it was futile to fight this awesome force. I began to reflect on my life and I started to say thank you to everyone I had known, everyone in my life who’d made a difference. I said goodbye and thank you to Gail, my mum, dad, sister, my friends above ground. I literally said thank you to a huge list of people, and the list now seems so long that I imagine I was awake some time before closing my eyes and thanking God himself for the wonderful life I had lived. It is a sad situation knowing you can never truly say goodbye to your loved ones and friends. I seemed to have an eternity struggling for air remembering everyone, yet I was told afterwards it couldn’t have been much more than a minute. It was the longest minute of my life and I could feel myself getting tired. I don’t remember whether I thought I’d be rescued. I just remember getting tired and I went to sleep. I often think about the moment I died. It is an emotional wall of thoughts that all arrive at the same time. It is completely overwhelming and can appear out of nowhere, leaving tears in my eyes in their wake. I am slowing learning to control them, but they come when they come and I am learning to live with it. Was I given a second chance because I was grateful for all the experiences life had bestowed on me? I was always convinced that I was destined to do something great and that I would give something back to society. Sadly I’d failed, and failed dismally. Yet I was grateful for the time that I had had. I think this emotion stopped me getting stressed. Since then, on my never-ending quest to understand what happened that day, I learned that you can only feel one emotion. When you are incredibly stressed, frightened or sad, you can replace this emotion with gratefulness. I believe keeping calm must have played a part in my rescue. Above ground my team-mates were busy organising themselves. 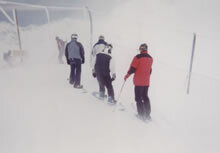 Stephane had instructed everyone to switch off their avalanche detectors. He hopped around the snow trying to locate me. After a couple of minutes he picked up my signal and pinpointed me by extending a thin rod and probing through the snow.I don’t recall feeling it but I had two small bruises where it connected with my waist, so I was obviously out cold at this point. Lee had been putting together the shovel he had been carrying and everyone started digging for their lives. Or rather, mine. Dan carried on digging listening to the instructions from Danny Rob and Alex. Quite by chance, this year’s expedition had two doctors with us. My advice to anyone going off-piste, always take a thoracic heart surgeon and a casualty doctor with you! The two doctors gave clear instructions to the group that as soon as they were able to get access to my mouth they were to move out of the way and let the professionals take over. Eight minutes passed before they managed to pull me from the snow. I was unconscious, not breathing with little or no pulse. I awoke to what I can only describe as the softest lips I have ever felt and the worst headache imaginable. Danny Rob, the chap who originally knocked me off my board brought me around. Using some rather severe tactics including punching, slapping and putting his hands down my throat to provoke a reaction. I felt battered and bruised, but I was alive and although disorientated I had miraculously survived.